He was first visited by Shaggy, Scooby and Daphne, with Scrappy and Flim-Flam, after they needed some help with their plane, which had crash-landed in a nearby temple in Nepal. 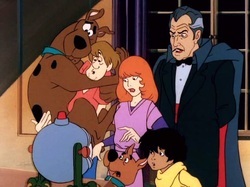 After Shaggy and Scooby unwittingly unleash thirteen terrible ghosts from the chest in which they were locked, Van Ghoul tells them that they must trap them again. "Why us?" a terrified Shaggy moans, to which Van Ghoul replies, "Because you let them out!" Van Ghoul acts as a mentor, and readily guides Scooby and Shaggy (in the first episode it is strongly established that he believes the pair needs guidance to keep out of trouble). In "Scooba Kadoobra", he directs them to the palace where Maldor the Malevolent currently has taken over. Despite valiant effort on Scooby's part (by stealing the wand Maldor wants) it is Van Ghoul's advice that a Danish prince- Scooby himself, who is a Great Dane- that saves the day. A reboot has been done to Vincent Van Ghoul in the new series of Scooby-Doo, Mystery Incorporated. He first appears in Legend Of Alice May as Shaggy, Scooby and Velma are watching a movie of his, meaning he's an actor. Then, in Nightfright, Shaggy and Scooby win a contest (with only two entries) to go over Van Ghoul's on a dinner, but since they've forgot he comes over their place while they're watching one of his movies. When they go to his house he locks the big house as he's making a reality show bringing some of his horror-movies creatures to the manor to scare Shaggy and Scooby until a real monster comes asking everyone to scream, because he's Nightfright. Van Ghoul's scared to death from that creature, but since it's only asking everyone to scream and be scared, Van Ghouls doesn't pays it any attention (even he's scared to death, he's one actor).